The introduction of the Bombard Typhoon series is aimed at the recreational user who demands a first quality boat at a bargain price, and is supported at every level by over 120 years of experiance and a vast dealer network. Compare that to any other inflatable boat manufacturer and understand why Bombard ranks as #1 for first time buyers and seasoned professionals alike. 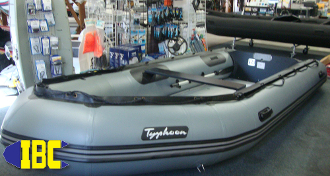 The Zodiac/Bombard Typhoon series of inflatable boats represents the best quality for the money in a world of ever changing cheap internet knockoffs. Demand the lineage and quality of a Zodiac/Bombard and get the very best boat for the money. For the more professional users IBC still offers the Bombard Commando series as well as the easy to love and use Typhoon series under one roof. Order your first boat online thru our website or come in and talk to people who use these very same boats themselves everyday. Ask about a boat and motor package and find your own little slice of Heaven in a Bombard. The Bombard Typhoon 470 AL is fifteen and a half feet of fun in an easy to assemble and use boat. No wonder Bombard sells better than all other brands worldwide. The best deal afloat today bar none. Well known the World over the Bombard brand is used on oceans, bays, lakes, and rivers by professionals and discriminating users who demand the best boat for their money. This boat will fill the needs of the adventurer, fisherman, crabber, water sports enthusiast, or a family looking for some fun in the Sun. A long time favorite on the West Coast and beyond for it's incredible durability and performance making it the best 470 on the market for the money. Genuine Zodiac/Bombard quality with a nice price . These are always a sell out when we get them in so don't wait or you will litterally miss the boat.